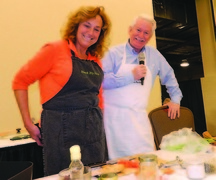 The Maine Harvest Festival in Bangor featured over 120 of Maine’s top producers with cooking demonstrations, lots of tasty treats and many great stories. We were impressed! The idea of celebrating farm- fresh foods and products is catching on. Thousands flocked to Bangor’s Maine Harvest Festival held in November. It was a bitter cold day when we attended and as we queued up for our turn to enter, I overheard the woman in front of me tell her husband, “I hope there’s lots of samples because I love to sample!” She must have been pretty happy, since almost every booth offered a taste of something. I was struck by the ingenuity of Maine people and by the diverse array of products. There were more Maine products than one could imagine possible. We found samplings of food like ploys (made from buckwheat flour), a variety of cheese, fresh pasta, chocolate and several booths of smokehouse meat. Then there were the condiments: honey and maple syrup, stone- ground mustard, spices, herbs and jams. There seems to be a whole market of small entrepreneurs creating BBQ and hot sauces and many jarred salsas. They took some great produce, a good idea and started creating a line of tempting (and extremely tasty) condiments. Of course, it wasn’t just about food products. Beautiful handmade crafts were well represented. Wool felting is extremely popular right now, and I’ve been experimenting with some ideas myself. I was pretty excited to learn more about the process of felting wool roving. The Midsummer’s Night Farm had impressive works of art that were truly unique. I resisted buying the wool battings that would have led me to another craft that I probably shouldn’t start. I did purchase some organic Vindaloo Marsala seasoning from Gryffon Ridge Spice Merchants in Dresden. They must have been offering over 100 varieties of seasonings! After trying Fieldstone Farms gourmet dip mixes, I quickly picked out four packets. For lunch, the line was long for Pizza on the Fly, but I waited happily for an incredible serving of wood-fired oven pizza. Their wood oven is built on a trailer so they can take it anywhere. And by watching the speed and finesse they used stretching the dough out thinly and applying various toppings, you could tell they have it all figured out. I enjoyed my pizza in the heated tent, a welcome relief from the cold weather. Video played, featuring different farms around the state. This was our first glimpse of the new Cross Center that replaced the Bangor Auditorium. We just saw part of it, but it is beautiful. From Millinocket to Saco, the state was pretty well represented. This festival is the heartbeat of farmers and producers. It had the feel of a giant farmers market and seasonal craft fair all rolled into one great event. It is nice to see people truly appreciate quality products made in Maine. It was a feeding frenzy. So many booths. So much food. So little time. We had planned to visit the Festival for a couple of hours but ended up spending five hours there. This is a festival we won’t miss in the future. I’ve never seen so many great Maine producers of fresh farm food and other products in one place. My only complaint was that too many people showed up! This year’s crowd topped 5,200 and it was difficult to wend our way through the aisles. Judy Perkins, festival director and owner of Garden Ridge Farm, has put together a very special event, and it will continue to grow in popularity. They are going to need more space. I began my morning with ploys filled with a delicious blueberry sauce from Bouchard Family Farm, and then scooted across the aisle to try a few wonderful hand-blended herb dips from Westminster Whimsy in Chelsea. Tracy Hutton, of Chelsea, put herself through college with these dips, and I can see why. They are really good. The aroma of Albie’s BBQ sauce pulled me to their booth where the pulled pork was fabulous. In their third year, this business is still a sideline started after lots of encouragement at their very popular family barbecues. 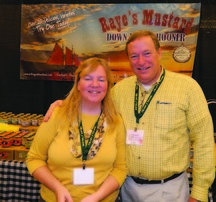 Al and Linda Valcourt, of Hamden, both have fulltime jobs so, like many small Maine food producers, theirs is a part-time venture. Next up was Josh and Amy Clark — a young couple who both grew up on farms — and their Crooked Face Creamery of Skowhegan, Along with turning out their national award-winning cheeses, they also raise whey-fed port and native grass-fed beef on their farm. Their samples were generous. Already getting full, I passed by Moxie jelly, breads, fruit and more. But I was stopped in my tracks at Sandolini’s Buckwheat Dollars. Sandy Cohen was an artisan bread maker, but had to stop because of a health problem. So he invented his amazing, healthy organic crackers — low on the glycemic index — and turned those into Sandolini Dust, a healthy topping for smoothies. I don’t know how Sandy knew I’d recently started making smoothies for breakfast with recipes provided by our youngest daughter, but the minute he mentioned smoothies, I bought some of his dust! When we hit the third row, I heard a familiar voice say, “I came home one night from beaver trapping …” Sure enough, on the festival’s stage was Kate Krukowski Gooding of Black Fly Stew, author of one of my favorite cookbooks, “Wild Maine Recipes.” On stage with Kate was Bill Green, TV 6’s celebrity reporter and outdoorsman, and it was a very lively duo. The audience was packed and Kate was cooking up Curried Beaver Stew from her new cookbook devoted entirely to recipes for beaver. You may be gasping now, but the audience gobbled up the samples and I might have had a few myself! Stepping away from a visit with Bill and Kate, I looked down on the floor and saw a button that said, “Feed me.” Perfect! Alas, Linda hustled me past the Northwoods Gourmet Girl’s cookies and sped me down the fourth aisle. But when we got to Lakonia Greek Products of Saco, we stopped to sample olives, oils and dips, enjoying Melissa Rioux’s fast-paced story of her Greek mother and background. Maine has some very interesting people! We checked out the beer and wine room, later visiting with our good friends Karen and Kevin Raye, sampling some of their new mustards and enjoying the fact that Kevin could take a couple of days off from his campaign for the Republican nomination to Congress in the Second District to tend to his business. I use only Raye’s mustards and that’s not because I am a Republican. You might find it unbelievable, but now I was ready for lunch and Frank Pendola’s BBQ booth outside the arena pulled us out into the cold air. I’d visited with Frank on our way into the arena and heard all about his Nostrano Italian Country Table in Boothbay Harbor, and made plans to visit there next summer. On this day, I went for the ribs, cooked for 9 hours in Frank’s portable grill. They were spectacular. As our fifth hour approached, we were both winding down. We headed home with a bag full of goodies and a promise to Judi that we’d be back next year. Please join us!